Info Wyandotte – Page 4946 – Welcome to Wyandotte Daily! The 13th annual Wyandotte County Back to School Fair will be held on Saturday, Aug. 9, at two locations: Kansas City Kansas Community College and KCK Boys and Girls Club. The goal of the fair is to help make every child school ready from day one. Over 5,000 Wyandotte County students are provided basic school supplies to start the new school year as well as immunizations, sports physicals and an opportunity to learn about community programs and services. The success of this project relies on contributions from the community. Donations of dollars to purchase items are needed as well as the contribution of time. Volunteers are needed prior to the event to help sort supplies and to pack the bags for the various grade levels. On the day of the event help is needed with set-up, registration, distribution of the bags, library books, food and help keep the site neat and tidy; and then of course help with general clean-up after the event. Over a hundred volunteers are needed on the day of the event. If you want to volunteer, register online at www.unitedway-wyco.org and click on Back to School Fair. If you would like to make a financial contribution, go to www.unitedway-wyco-org, click “Give” and check the Back to School Fair box. Or mail payment to United Way of Wyandotte County, 434 Minnesota, Kansas City, KS 66117; be sure.to note Back to School Fair donation. You can also contact Cathi at the Volunteer Center of the United Way of Wyandotte County, 913-371-3674 or at Chahner@unitedway-wyco.org. This is a wonderful opportunity for groups looking for a service project. For more information on how you can give, advocate and volunteer, contact Cathi Hahner, director of volunteer services, at 913-371-3674 or at chahner@unitedway-wyco.org. You can find volunteer opportunities by checking out the website, www.unitedway-wyco.org and click on Volunteer. 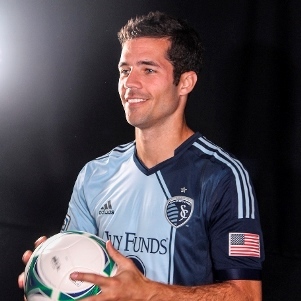 Sporting Kansas City midfielder Benny Feilhaber was announced as Major League Soccer’s Player of the Week on Monday, receiving the most votes from the North American Soccer Reporters for week 19 of the 2014 MLS season. Feilhaber, 29, contributed to both goals in the team’s 2-1 victory at Columbus last Wednesday and scored in his second straight match as the reigning MLS Cup champions defeated the LA Galaxy on Saturday at Sporting Park. Feilhaber gave Sporting KC a 1-0 lead at Crew Stadium when his corner kick was headed home by C.J. Sapong in the 42nd minute. The assist was his team-leading fifth of the season and 20th of his MLS career (including postseason). Three of his five assists in 2014 have come from set pieces, second most in MLS behind Brad Davis (4). In the game’s final minute, Feilhaber’s first-time shot from outside the penalty area beat Crew goalkeeper Steve Clark and struck the underside of the crossbar to move the team back atop the Eastern Conference standings. The goal is Sporting Kansas City’s latest game-winning goal of the season and is one of five nominees up for MLS Goal of the Week. The road win — the team’s fourth straight, a new single-season club record — marked the second time in Feilhaber’s four-year MLS career in which he recorded a goal and an assist in the same match. On Saturday, Feilhaber followed the mid-week performance with his third goal of the season, second most among Sporting KC players, with a free kick from 20 yards out. The right-footed strike curled beyond the reach of LA Galaxy goalkeeper Jaime Penedo and into the upper corner for the 11th goal of his MLS career. It marked the second straight season Feilhaber scored directly from a free kick, accounting for the team’s only two free kick finishes in the past two years and leaving him one behind Camilo for most by an MLS player since the start of 2012. In 2014, Feilhaber has started the most MLS matches (19) of any Sporting KC player and has suffered the second most fouls in MLS (48). He is among the top five MLS midfielders in the following statistical categories: passes (1050, No. 5), passes in opponents half (654, No. 5), successful passes in opponents half (510, No. 5), passes into final third (196, No. 2), touches (1399, No. 5), duels (232, No. 4), duels won (127, No. 5) and recoveries (153, No. 4). Today’s honor is Feilhaber’s first career MLS Player of the Week recognition, finishing ahead of Robbie Keane (LA) and Bernardo Anor (CLB), and second by a Sporting KC player this season (Graham Zusi, Week 4). The team has also won each of the last two MLS Player of the Month votes with Dom Dwyer (May) and Eric Kronberg (June) receiving the accolades. Several area students have been named to the dean’s honor roll at Wichita State University. Students on the dean’s honor roll are enroll full time and have at least a 3.5 grade point average on a 4.0 scale. Those on the dean’s list from Bonner Springs: Melissa N. Cisneros. Those on the dean’s list from Kansas City, Kan.: Mario A. Hawkins-Myers, Christian R. Osuna, Katherine O. Osuna, David A. Selleck, Andrea L. Stitt and Samantha A. Watson.